● EASTER EGG HUNT: Friday April 12. Parents- be there at 10:45 for egg hunt at 11am. This will be a half-day of school for all children. ● SPRING BREAK April 13-April 22cnd. Classes resume Tuesday, April 23. ● Final Class day for ALL students: Thursday, May 30th. We hope the cold weather is behind us and look forward to the coming signs of Spring! We are greatly appreciative to all the parents who have come to share their culture, heritage, and expertise with us as we present different countries and holidays to the children. They are eager to learn from their peers as well and have absorbed so much new information from these visits. Thank you! Parents are welcome to attend the annual Georgetown Montessori Easter Egg Hunt. TO US IN THE MORNING AT DROP-OFF. Old Man, and some lovely songs in French that Ms. Houda has taught. We are also beginning songs for our Mother’s Day program in May. Details will be forthcoming. Children have been learning songs with movement, rhyming songs, and clapping syllables and various rhythms. We also practice our counting, the days of the week, months of the year, and discuss the weather and seasons. himself and encourage it at home! In the Art area, the children have been using watercolor, glitter, making collages, cutting and doing sticker work as well as drawing. Children also enjoy pin punching different metal inset shapes and various continents and countries. Miss Lee has introduced various art projects incorporating different mediums and materials (line drawing, pointillism, stick painting, etc..). 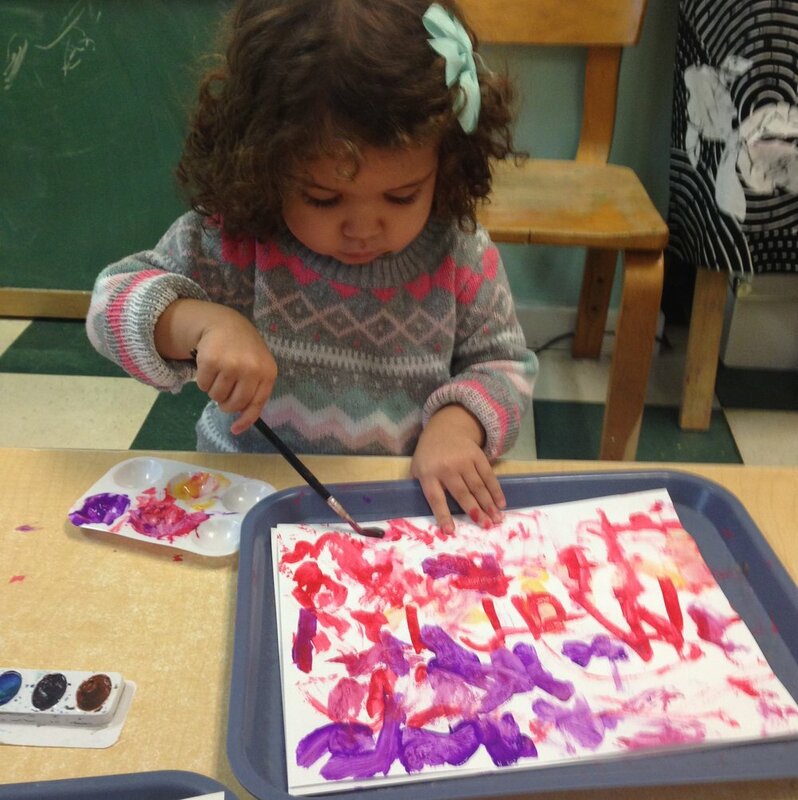 Children really enjoy art and it refines their fine and gross motor skills so well. In the Sensorial area, we are learning about the constructive triangles, ideas of volume (the cylinder blocks), as well as length and width (the brown stair and red rods). Children are developing a mind for the abstract via their concrete experiences with these materials. Such experience includes ordering and matching the color tablets (visual discrimination), Solid cylinder block and pink tower/brown stair exploration (visual and dimensional discrimination), and are distinguishing between various surface textures via the touch boards, fabrics, and thermic tablets (tactile sense). These exercises are combined with a blindfold for added difficulty. They are learning about polygons, different leaf shapes and names in the botany cabinet as well as geometry cabinet. Children have also been introduced to sound cylinders and the bells. These two lessons aid the child’s auditory sense, as he will be able to distinguish sounds, match those sounds, and eventually grade the sounds (i.e., highest to lowest). Both trinomial and binomial cubes the children employ daily, which aid in the child’s mathematical mind (visual discrimination) and prepare her for later algebra and geometry. All the triangle boxes and knobless cylinders we use in the classroom also aid this visual sense development. Some older children have mastered many of the sensorial lessons and are able to grade or match from a distance, build with a blindfold, or incorporate language to these sensorial impressions (ie., small, wider, tall, tallest, darker, loud, softest, etc). Their sensory discrimination skills are greatly improved! Unless the children are seriously damaging these materials, we encourage exploration in the sensorial area as much as possible. You may have seen this happening already from the pictures on our Facebook page (building of the towers...)! In Language, the children are busy doing metal insets, learning sandpaper letters and phonograms, letter writing, doing the phonetic and phonogram object boxes and using the movable alphabet to build words and phrases. The older children are becoming more proficient at writing and reading words. We have especially focused on forming words and the middle and ending sounds associated with a particular word. Please encourage a reading environment in your home by reading to your child as often as possible. In Math, the children are learning the number rods, sandpaper numbers, spindle boxes, and cards and counters. Afternoon children are continuing work with the decimal system beads and cards as well as counting the bead chains. They are learning static and dynamic addition and working with the teen boards and beads. 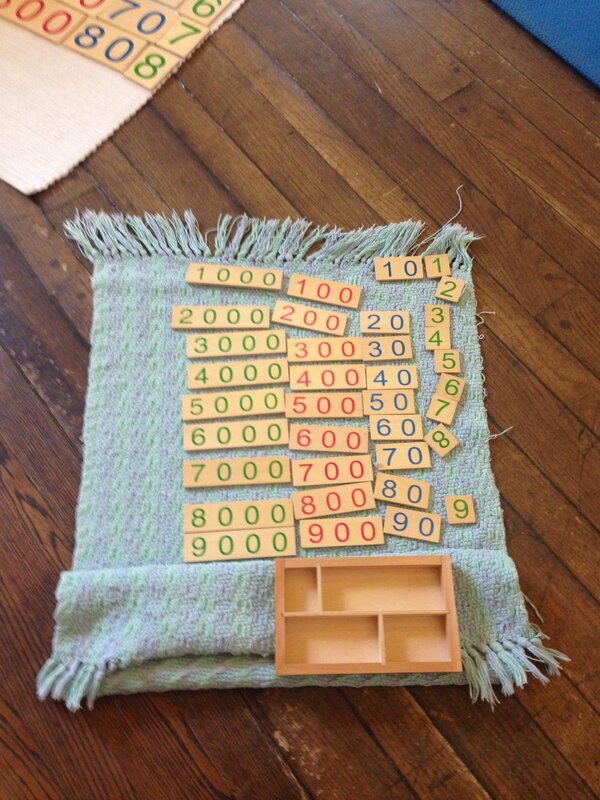 The Montessori approach to Math is very concrete and linear. We begin with simple counting exercises before moving on to more complex adding and subtracting. Encourage your child to practice his counting with you at home! continents of the world, drawing their own world maps using the colors representative of each continent, and learning about land and water forms (island, peninsula, strait, etc). Last month the children learned about South America, focusing especially on the animals of the rainforest. We greatly appreciated Isabella’s father coming to give a presentation on Brazil to the afternoon children! In March we have been discussing EUROPE and Ireland, its people, animals, habitat and culture. THANK YOU to George’s parents Maggie and Gareth for their wonderful presentation on Ireland! We also had wonderful presentations from Laila and Nora’s mom Samar on Palestine to round out our earlier study of Asia, and the children greatly enjoyed a celebration with Ariana’s dad of a Baha'i holiday! In Science, we focused on the solar system in February and March. The children are keenly interested in outer space and have enjoyed hearing information about the planets, looking at picture cards of the solar system, doing planet activities and puzzles, making their own constellations, and singing songs about the planets. This month we have also discussed many different types of Reptiles, their behaviors, adaptations, and life cycle. THANK YOU to Sam’s mom Katie for organizing an afternoon visit from a reptile professor from the University of Maryland! The children were thrilled to see live turtles and snakes. In Music class with Mr. Ricardo, the children have been introduced to jazz, the instruments of the orchestra and are learning to count various rhythms and tempos by conducting and listening with a musical ear. He has also explored several different genres of music (classical and popular tunes) that the children enjoy singing and dancing along to. We also had wonderful afternoon movement lessons from Abe’s mom Rebecca and Mari’s mom Lisa to promote balance, gross motor skills, and strength. Thank you! As we look ahead into next month, in Science, we will begin study of seeds and flowers, as well as discussion of birds. In Circle time, we will begin practicing for our Mother’s Day performance as well as learning new songs, including: The Violins Ringing, White Coral Bells, Jim Jam Joe, and The Ants go Marching, to name a few. In Geography, the children will be continuing their study of Europe- its climate, culture and history, as well as begin to discuss Australia (May). We will be learning the names of the countries and the people that make up those different countries (food, lifestyle, animals, climate, etc). If any other parents are interested to present on any one country of Europe, please do not hesitate to reach out to the teachers! Thank you again to the parents who have so generously provided their time and knowledge. Children following in the Montessori Method of learning have a profound and unique opportunity in their education: they are the principal directors. Each child in a Montessori environment follows her own individual path, choosing their own work or activity; due to this approach we do not have lesson plans as public schools do, but rather “follow the child”. The guides (or teachers) are present solely to support the child’s path, presenting the material to her and to be the child’s principle link to their own learning. In this manner, each child’s curriculum is unique to their current needs and desires. As guides to your children’s development, we create a place where the children can truly thrive and develop. We want to protect and promote their purposeful activity, concentration, to preserve their work and foster their individuality. 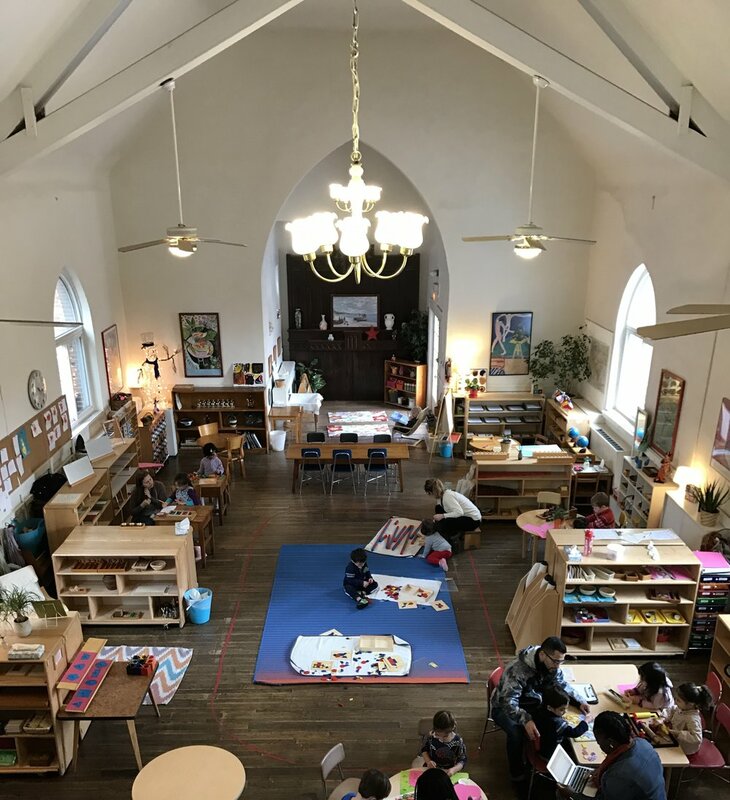 This individualized approach to education is what makes Montessori so special and which sets it apart from other, more structured learning environments. We are very happy to discuss more of the theory behind this approach if you so wish.